The classics and the contemporaries all share a place in the Jeep® history book. Take a ride in the time machine, from ’41 to last Tuesday. Check it out if you haven’t already..
Jeep Grand Cherokees probed for fire risk. If you have been considering trying out a Jeep or purchasing a new one, this month might just be the month to do it in. 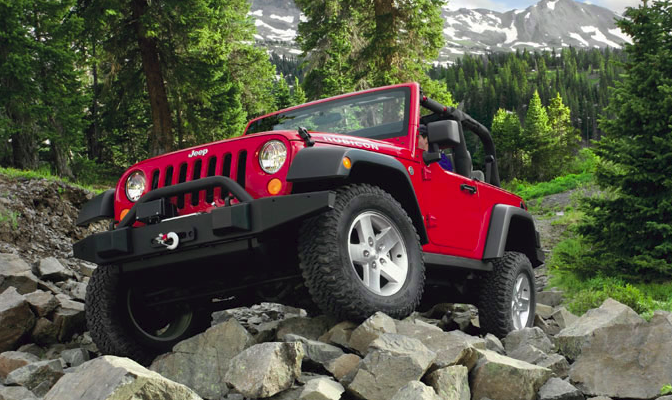 During August 2010, Jeep is offering large cash back rebate incentives and a 60-day money back guarantee on every model except the Wrangler. No interest financing is available on every Jeep during August. Jeep’s 60-day Pledge of Adventure promises buyers that if they are unsatisfied with their new Jeep SUV, they have the option to return it for a full refund within 60 days. Jeep will also pay for your monthly payments that were made during the first 60 days. The Pledge PLUS is available on all Chrysler, Jeep, Ram and Dodge vehicles except Wrangler and Viper. There is no turn-in or trade-in required to be eligible for this program. The Pledge PLUS option is in lieu of the core consumer incentive programs, including Consumer Cash, APR offers and all Bonus Cash. The customer must choose either the Pledge PLUS option which includes Chrysler group making the first two payments or the effective Consumer incentives. This choice must be made at the time of sale. This option offers a customer the option to return a purchased (Type 1 sale only) vehicle after 30 days of ownership and within 60 days of the delivery date. Return requirements are outlined in the Customer Responsibility section below. Customer must sign the Pledge PLUS Acknowledgement form to signify which plan was chosen. Fleet and Commercial vehicle sales are not eligible. Eligible vehicles must be delivered during the program period. There is no sold order protection for this program. For the rest of the details visit the Jeep website. Chrysler Blog – Ensuring Quality: How Chrysler Group is Going the Extra Mile, Or Extra Million. On a whole new ride. The Jeep Rocks & Road Tour 2010 brings you a unique way to experience Jeep. Don’t miss your opportunity to get behind the wheel at an event near you. The Jeep Rocks & Road Tour hits the road. Join in on a totally unique Jeep adventure as Jeep Rocks & Road Tour travels coast-to-coast. Here is just a couple coming up in July. There are many, many more. Just visit the Jeep Rocks and Road Tour to find an event near you! General Information: All drivers must present a valid Driver’s License and be 18 years of age or older. Guests under 18 are welcome if accompanied by a parent or legal guardian. Hours may vary between the active hours of the Columbus Jazz & Rib Festival, and operating hours of Jeep Rocks & Road; please refer to the above-posted hours for Jeep Rocks & Road ONLY. Fee Information: The Columbus Rib & Jazz Festival is free and open to the public. There is no incremental fee for the Jeep Rocks & Road Tour. Jeep Owner’s Playground: The Jeep Owner’s Playground is located approximately 1 block from the Rocks & Road Main Site, at the corner of Hanover Street and Nationwide Blvd. Do you have an iPhone? If you do you can get the TripCast by Jeep application downloaded on your phone for free. The TripCast by Jeep allows you to hit the road and track the progress of your driving adventures while allowing your friends to follow along and enjoy your photos, videos and notes in real time. With TripCast, users create a profile and add friends; then, when it’s time to do some adventuring the users set TripCast to start tracking their journey. Along the way, the user can flag spots and post photos, video, audio, or written commentary, then share that content with friends on Facebook or Twitter, or via email. You can start your adventure by downloading TripCast onto your iPhone JeepTripCast.com. TripCast™ by Jeep® is a FREE and easy way to track the progress of your trips and post photos, videos, audio clips and notes from the road to share with your friends in real time. At this time TripCast only supports iPhone 3G, 3GS and 4 devices.Feel free to email questions, comments and feedback to support@jeeptripcast.com. For more information and to sign-up on the web, go to www.jeeptripcast.com.